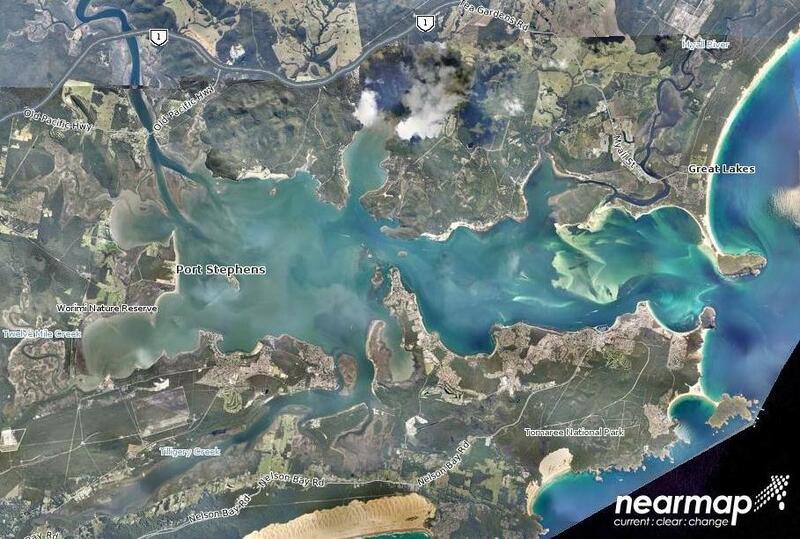 Visibility in Nelson Bay varies with the tides with clean water entering the bay with the incoming tide and dirty water exiting on the outgoing tide. This means that visibility is at its best at high tide and at its worst at low tide. The variation in visibility, in combination with strong tidal currents, means that divers typically only dive in the bay for a short period on either side of high tide. at its worst. A number of factors influence how clean the water will be at high tide. These factors include rainfall, the size of the tides, the clarity of the water outside the bay, and the direction of winds in the bay. To get the best chance of having good visibility in the bay, dive on a large tide, at high tide, after a long period of low rainfall, while waters outside the bay are clear, and while winds in the bay are still or from the south. Following periods of heavy rain visibility in the bay can be appalling, as large volumes of dirty water are flushed down from the Karuah River and Tilligerry Creek further up the bay. The figure above (from www.nearmap.com) clearly shows the dirty water entering the western end of the bay in April 2011 while the water near the entrance of the bay is still clear. The figure above shows a plot of average visibility each month in the bay, along with the monthly rainfall. Often period of good visibility coincide with periods of low rainfall, and periods of poor visibility coincide with periods of heavy rainfall. The final figure shows visibility plotted against the height of the tide taken from personal logbook records. 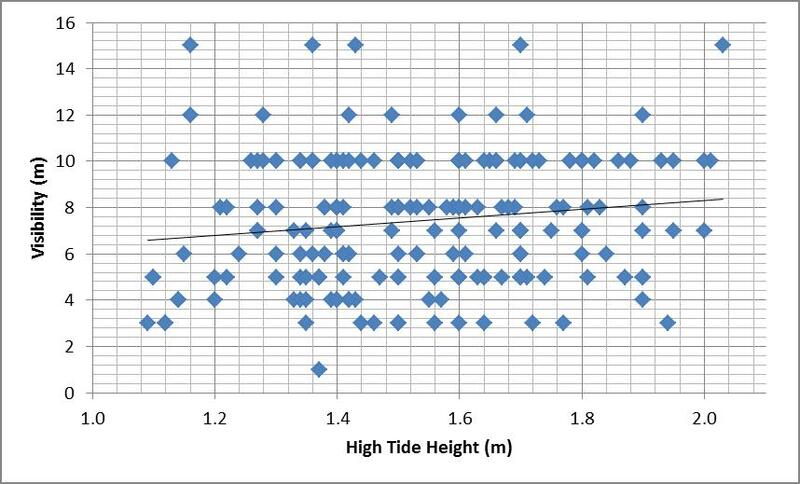 The trend line on the graph indicates that there is a slight tendency for larger tides to lead to better visibility, due to the larger volume of clear water entering the bay. However it is also clear that good visibility can occur on a small tide and bad visibility can occur on a big tide. 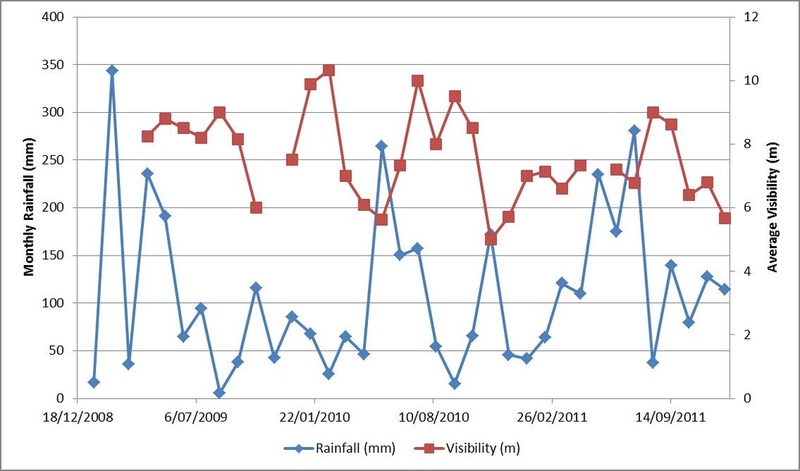 This next figure shows visibility plotted against monthly rainfall. 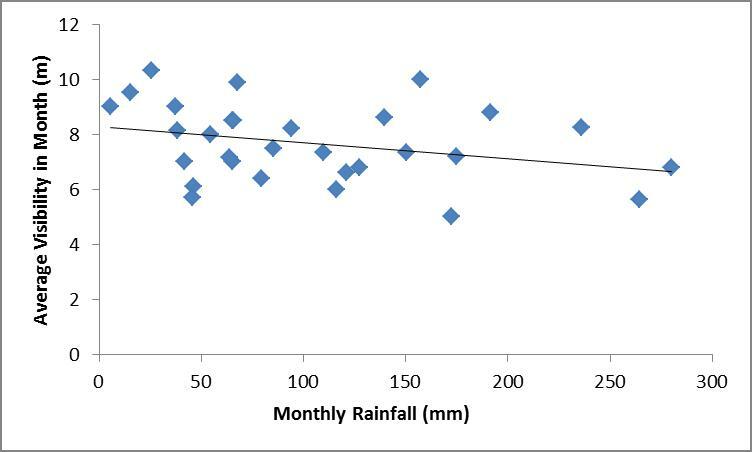 The trend line on the graph shows that there is a clear relationship between rainfall and visibility, with high rainfall contributing to low visibility.